Confident beginners and skilled students alike will enjoy making this quilt while learning square-in-a-square units, four-patches, and uneven nine-patches. Detailed pressing instructions are included so pieces nest together to reduce bulky seam allowances. Safe Travels version is on p. 46; Flower Garden version is on p. 51. This quilt is perfect for an all-day class of 6 hours in length. Many students will get at least one row completely finished. TIP: Give a full-size coloring page to each student to preplan their quilt (p. 50) or email quilterchickdesigns@gmail.com for a set that go with the book. Be sure to include your shop name and website address. TIP: Make a shop sample of one version of the quilt and make one block from the second version to showcase the versatility of this quilt. TIP: Make up a starter bundle of fabrics for the flowers in the Flower Garden version of the quilt. TIP: Encourage the use of a rotating mat for trimming units. There is no special classroom preparation needed for this quilt, although there is a considerable amount of pressing, so a generous number of irons would be helpful. 1. Encourage students to come to class with cutting finished (p. 47 or 51). 2. Have students make 8 gray and 8 yellow square-in-a-square units (p. 48). 3. Have students make 4 each of: yellow four-patches; grey four-patches; black four-patches (p. 48). 4. Have students make 4 uneven nine-patches (p. 49). 5. Have students assemble 4 blocks. 6. If time permits, have students sew blocks together with sashing (p. 50). 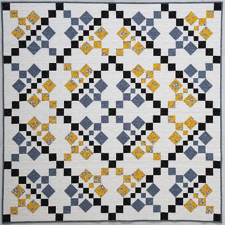 Confident beginners and skilled students alike will enjoy making this quilt while perfecting chain piecing half-square triangles, quarter-square triangles, and flying-geese units. Detailed pressing instructions are included so pieces nest together to reduce bulky seam allowances. Chain and Bar version is on p. 18 and Holiday Chain and Bar version is on p. 25. This quilt is perfect for an all-day class of 6 hours in length. Many students will be able to finish one row of the quilt. TIP: Give a full-size coloring page to each student to preplan their quilt (p. 24) or email quilterchickdesigns@gmail.com for a set that go with the book. Be sure to include your shop name and website address. TIP: Refer students to the Cutting Note on p. 19 to ensure they're happy when they cut out the quilt! TIP: This is a great quilt to include in a skill-building series. Students will learn to make half-square triangles, quarter-square triangles, and flying geese all in one quilt. The generous size of these pieces makes the quilt a great choice for beginners. 1. Encourage students to come to class with cutting finished (p. 20). 2. Have students make one-fourth of the required large half-square triangles and one-fourth of the small half-square triangles shown in the chart (p. 21). 3. Have students make one-fourth of the quarter-square triangles (p. 21). 4. Have students make 8 of each color of flying geese (p. 22). 5. Have students make Flying Flocks for 2 blocks (p. 22). 6. Have students assemble at least 2 blocks (p. 23). Confident beginners and skilled students alike will enjoy making this sweet, snuggle-size quilt of interlocking chains. Detailed pressing instructions are included so pieces nest together to reduce bulky seam allowances. Wishing Rings is on p. 54 and Gears is on p. 57. This quilt is perfect for an all-day class of 6 hours in length. Students should be able to finish at least one row (frequently two) of the quilt. TIP: Give a full-size coloring page to each student to pre-plan their quilt (p. 56) or email quilterchickdesigns@gmail.com for a set that go with the book. Be sure to include your shop name and website address. TIP: Make a shop sample that shows off your favorite fabric—this quilt is fabulous in large or small prints. Do you have a lot of customers who need quilts for twins? This is great size for gifting! It works well if two colors are used in opposite places in the quilts. For example, one quilt with a white background and a blue print and the second with a blue background and a white print. TIP: This is a great project for showcasing a variety of ways to make half-square triangles from products in your shop. Enough yardage is included for most alternate methods. Encourage the use of a rotating mat for trimming. In addition, sharp new pins really help when joining the intersections on this quilt. 1. Encourage students to come to class with cutting finished (p. 53). 2. Make one strip set (p. 54). 3. Make stitch-and-flip units (p. 54). Make 10 of Steps #1-4. Make 20 of Step #5. 4. Assemble 3 blocks. Sew Row 1. If time allows, make 2 more blocks. Confident beginners and skilled students alike will enjoy this fun-paced class of interlocking angles. Most students will complete at least one-fourth of the quilt. Betsy’s Quilt is on p. 8 and Betsy’s Scrappy Quilt on p. 11. This quilt is perfect for an all-day class of 6 hours in length. TIP: Give a full-size coloring page to each student to pre-plan their quilt (p. 11) or email quilterchickdesigns@gmail.com for a set that go with the book. Be sure to include your shop name and website address. TIP: This is a great project to showcase a variety of tools for trimming half-square triangles and squaring up blocks. A rotating mat is also beneficial. Take time to demonstrate a variety of products. This class works best if students have wall or floor space to lay out one quarter of the quilt. 1. Encourage students to come to class with pieces already cut (p. 9). 2. Sew the units as shown on p. 10. Note that for the class, students need only make one-fourth of the units at this time. 3. Refer to p. 10 for layout of the units made above. Confident beginners and skilled students alike will enjoy making this quilt while learning strip piecing, stitch and flip, cobblestone borders, and star-sashing techniques. Detailed pressing instructions are included so pieces nest together to reduce bulky seam allowances. Many students will be able to finish one large star and one border. Confetti is on p. 26 and Confetti Blues is on p. 33. TIP: Give a full-size coloring page to each student to pre-plan their quilt (p. 32) or email quilterchickdesigns@gmail.com for a set that go with the book. Be sure to include your shop name and website address. TIP: Demonstrate how a rotating cutting mat (at least 12˝ square) can speed up this process. 1. Encourage students to come to class with cutting finished (p. 27). 2. Have students make 4 small blocks (p. 28). 3. Have students make 4 star-sashing units (p. 29). 4. Have students assemble one large block (p. 29). Step #1 – Make one strip set and subcut 20 units. Step #2 – Make one strip set and subcut 20 units. Step #3 – Make 20 units. Step #4 – Make 10 units. Step #5 – Make 9 units. 6. If time permits, have students make one corner block (p. 31).